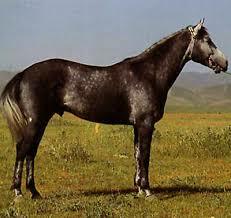 Karabair, or Karabairskaya, horses are a very old breed based on ancient stock that has been documented as being in the Uzbekistan area before the Christian era. It is likely that the Karabair developed through a mixture of Arabian and Mongol blood, later influenced by the desert horse breeds from the neighboring countries, such as the Turkomene, and further infusions of Arab blood. Uzbekistan is still populated by a vast number of nomadic peoples who have been, through the years, the principal breeders of the Karabair. Their lifestyles accounts for the number of different breeds which have gone towards the development of the Karabair. They have similarities to the Arab, especially in their innate toughness and endurance, as well as their speed and agility, although physically they are less graceful. They are a fairly central element of life to the Uzbekistan people and are used for riding and driving, as well as in the ridden game of Kokpar. Kokpar/Buzkashi is a ferocious game which centers over gaining possession of a dead goat carcass - there are few rules and many injuries, and the Karabair with its bravery and speed is used almost exclusively to play. Karabair horses have developed in three different types, all of similar height: the first type is suitable for light draft, pack and riding, and is a heavier stamp; the second is lighter, and is mainly used for riding; and the third has conformation better adapted to draft work. Although now there is less distinction between the three. The heavier type has almost disappeared, and the other two types have more or less amalgamated. In appearance, they have the conformation of a stocky Arab, but with less refinement. They tend to have a small, but attractive head with a straight profile, and a well-muscled neck of good length. They have a wide chest which lacks depth, but sloping, muscular shoulders. The body frame is lean and wiry with no fleshiness, and a thin, fine skin. They have a short compact back, and quite sloping quarters. Often they appear to be more developed in the front half than in the quarters. The legs are quite fine, but strong with very hard hooves. Generally they are gray, bay or chestnut and stand between 14.2 and 15 hands high.